Mercedes GLC Forum > 2015+ Mercedes GLC Tech Section > Wheels, Tires, Brakes, and Suspension > The FREE all-season tyre swop. The FREE all-season tyre swop. With the first cold snap of autumn forecast for later this month, I was wondering if anybody here has now pulled the trigger and booked their car in to have it shod with free all-season tyres? For the uninitiated, the offer came about in February when Mercedes UK finally buckled under the wave of adverse publicity regarding a design fault which caused the front tyres of RHD models to skip sideways when manoeuvring at or near full steering lock. Dealers were instructed to replace the OEM summer tyres with all-season variants for any customer who had complained. A goodwill claim against Damage Code 2113800 would be submitted by the Dealer to MB UK. The offer could be taken immediately or deferred until as late as this coming winter. I had the OEM Hankooks on my 18" wheels swopped for Michelin Latitudes back in the summer but I was wondering about the availability of all-season tyres for 19" and 20" wheels as I've only heard of a suitable tyre having been sourced for the 21" wheel so far. Please post here if you've managed to get free new tyres on your 19" or 20" rims and let us know what make they are. Conversely, if you have run into problems getting your dealer to honour the offer, I'm sure we'd all like to hear about that too. I did it a few month back when I joined this forum and read about the issue. to be honest I regret it. I actually did like Pirelli and they were RFT. Dealer swapped to Verdenstein 20inch all season not RFT. It took 2 weeks to get replacement. So was quick job. I had to contact support for them to even send me a sealant tire kit for free. But they only sent it for 1 tire. Now, I don't really think if it will make any difference in reality, but if I have 2 punctures I am screwed. Luckily of course we all have free recovery by MB, so as long as I have mobile signal I should be fine. Verdenstein is a very highly rated tyre manufacturer, especially on the continent and it is good to see these are being offered as the replacement option for 20" rims. In the greater scheme of things I guess RFTs would give greater peace of mind but this would certainly come at a premium bearing in mind the cost of replacement RFTs when paying out of your own pocket. Good to see you did your due diligence and pushed for replacement tyres. I have to wonder how many fair weather purchasers are still oblivious to the RHD GLC design fault and will only become aware of it in the coming weeks when their OEM tyres can no longer retain the required flexibility in the colder temperatures to mask the tyre skipping trait. At the time of organising my swop back in June, the default response of the first tier Customer Services at MB UK was still to deny a problem exists and maintain what owners are experiencing is a non-safety related "characteristic" of the RHD model. Do post here if you are meeting resistance in getting your tyres changed, your experience may well benefit others in their negotiations. After 7 months of trying to sort this out have finally agreed a way forward with AMG customer services. I have 19 inch wheels on my glc43 (standard in UK), MB are unable to source 19 or 20 inch all weather tyres for the 43, they can source 21 inch. After a lot of discussion and phone calls I was given the choice of getting a set of 21 inch wheels and tyres at 50% of the cost or fitting 19 inch winter tyres. I have opted for the winter tyres and my dealer has agreed to supply and fit them and store my summer tyres free of charge. Thought I would post this in case anybody is in the same position. 2017 GLC AMG43 premium plus, night pack, leather, intel lights, 360 camera, side steps. Wow, having made the announcement back in February it smacks of weapons grade incompetence that MB UK have been unable to nail down approved all-season tyres to swop to for all the rim sizes available. It's almost as if the Dealers are being left to source tyres on a per customer basis. Romk1n was able to get Vredestein tyres which I assume was the Quadrac 5 for his 20s but it may be this was negotiated in isolation and probably those tyres are more widely available as he doesn't have a 43 with the wider rear rubber. It sounds like people with 21s are sorted with Continental ContiSports although they seem to be Star-rated for BMWs rather than MO-rated for Mercedes. Phil, is there an ongoing arrangement to refit your summer tyres for free next year? I bet there would be little change out of £100 for this as a chargeable service. I can see MB UK being thrown into more chaos (if that is even possible) when the cold snap predicted for the end of the month arrives and the whole world and his wife is clambering for an urgent tyre swop. Last edited by Toobad; 10-13-2017 at 12:01 PM. I am going on the understanding that swapping back and forth won't cost me anything, will let you know when I get them changed, if there is any cost it won't be happening and I will be going to the motoring ombudsman. You are correct regarding the incompetence, the original mail from MB said they only had issues sourcing 21 inch all weathers for the 43, they are the only ones they have been able to source 8 months on. I wonder how much rim damage will accumulate from the constant swopping. 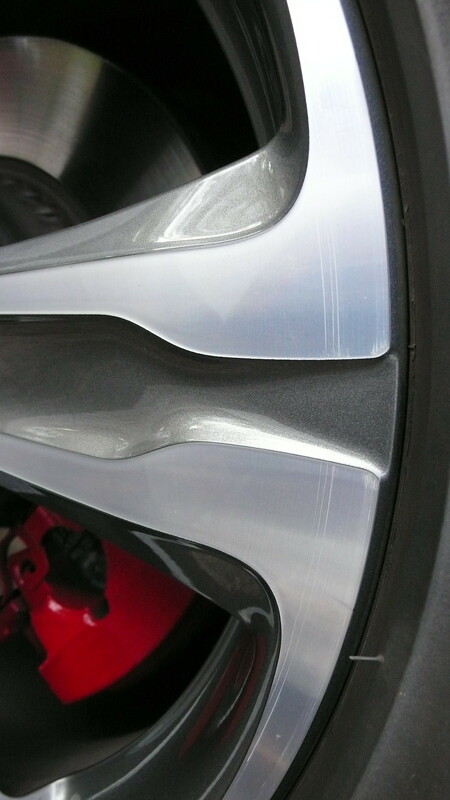 Although the Dealers use equipment that is supposed to be non-touch, I found a fine scratch line had been created in the lacquer all the way around the rims about half an inch from the outer perimeter. I guess this was left by the guide foot where its protection was either missing or worn away. It may be worth getting something in writing from your Dealer which commits them to a free annual tyre swop since over a period of time personnel and rulings can change and you don't want a battle on your hands every autumn. Will be doing this Toobad and will insist on check of wheel conditions (unmarked) before and after, they will have to swap the tyres in October and March until I change the car, could be an interesting conversation. Anybody booking in for the tyre swop would do well to take this picture along with them. It will help the Dealer to understand what you consider unacceptable rim damage when they put your wheel on their tyre machine. When they give you a loan car they always draw your attention to the condition of the wheels prior to handover and then check them again when you return. There is no reason why they shouldn't abide by the same rules when the boot is on the other foot. I naively didn't check my rims before leaving the premises and only discovered the damage when I next washed Red Ken so I had no recourse. Luckily the scratching hasn't gone through the lacquer on any of the rims so I will remove it the next time I get my machine polisher out. Sorry for your pain but thanks for making us take note. I would have exploded with rage, if they done that to my wheels, there is no excuse for such a lack of care.